When my boyfriend and I decided to plan a last minute trip to Amsterdam in April, I had no idea that it would turn into such a bookshop extravaganza. I had been to Amsterdam before but I don’t remember seeing even one bookshop. I must have been walking around with my eyes closed. There seems to be one on almost every street corner! Sure, there are plenty of things to see in Amsterdam; coffee shops, canals, clubs and cafés, but it’s the fantastic bookshops that got me excited. The first one I came across was closed. It had a quaint and inviting window display with some obscure looking children’s books and old postcards pegged across a washing line. Peering inside, I could see the shop was absolutely crammed with books! Seeing that this was a place not to be missed, I noted down the opening times and vowed to return. Finding ourselves in the same area a couple of days later, we headed for Lont Antiquariaat and arrived just in time to miss a sudden and violent rain shower. If you want to shelter anywhere from the rain, make it a bookshop! 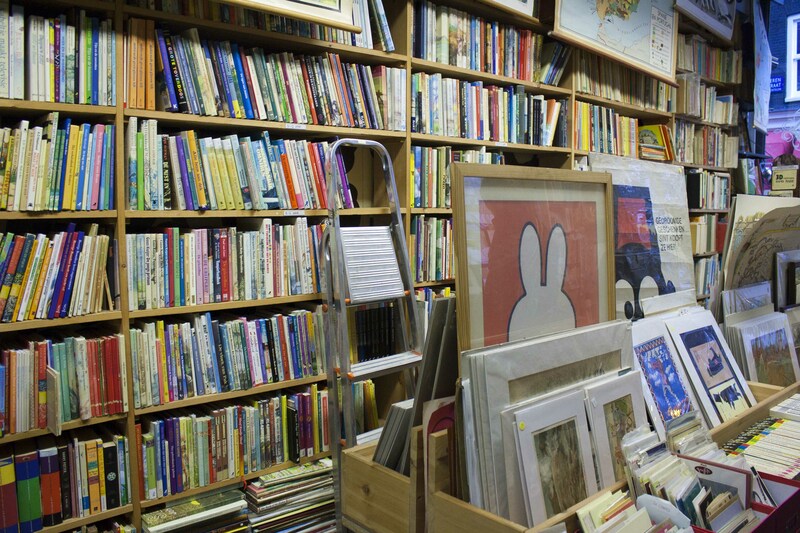 Knowing that we might be stuck for a while, I took my time browsing the shelves. It was difficult to know where to start. Whichever way I turned, there was yet another stack of books waiting to be rummaged through. In the end, I headed for the children’s section, which took up the whole of one side of the shop. Nothing cheers me up more when the weather is miserable than rows upon rows of colourful kid’s books. I even found a whole pile dedicated to books about cats! Opening T. S. Eliot’s Old Possum’s Book of Practical Cats at random, I tried not to giggle too loudly. Why do I not own this book? I was tempted to buy it, but with a weight limit on my luggage, I had to think smaller. As well as books, there is a large collection of prints and postcards. The prints are a real mix; cartoon animals, landscapes and vintage posters, all ranging in price from 2 – 25 euros. The postcards are kept in boxes, ready to be flicked through. They are mostly old and cheap but quite interesting to look at. At the door there is a stand with a pick of the best postcards to welcome you to the shop. 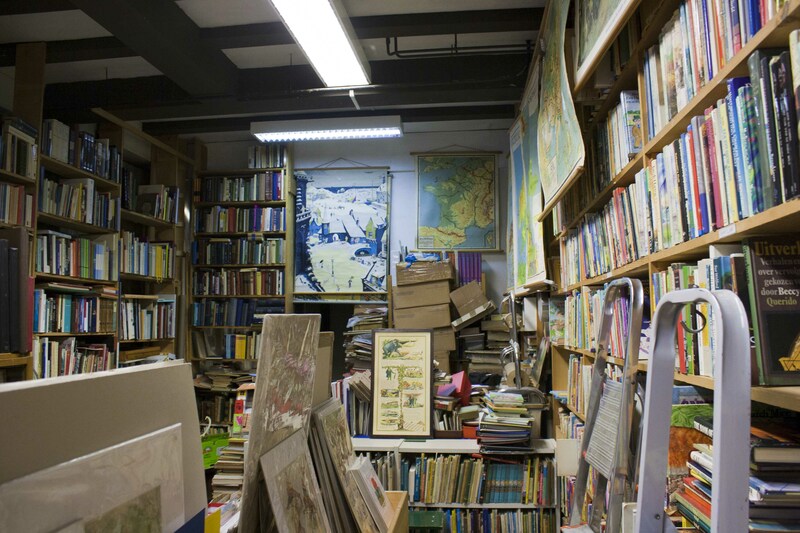 Lont Antiquariaat is one of those musty, messy bookshops that I love. There doesn’t seem to be any order to it. Adding to this effect, it was great to see maps hanging on the walls behind the counter and even pinned to the shelves. Some globes in the corner and pictures propped up at random all over the shop make the place look even more higgledy-piggledy. The rain started to ease off outside, and we had a full day before us with lots to do. So with one last glance around the shop, I found what I wanted. The bargain box! 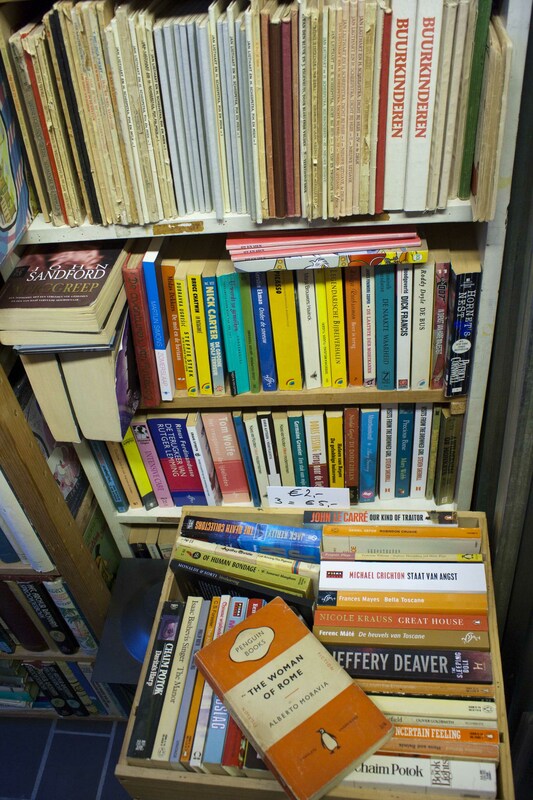 Any book for 2 euros or 3 books for 5 euros. Well, this was a deal that I couldn’t resist! Between us we bought Darkness at Noon by Arthur Koestler, The Woman of Rome by Albert Moravia and The Humbling by Philip Roth – All of them thin enough to fit nicely into our hand baggage on the return flight. I also managed to find a website in Dutch. Next stop in the Jordaan: Island Bookstore. Like your weblog (like all bookish weblogs). 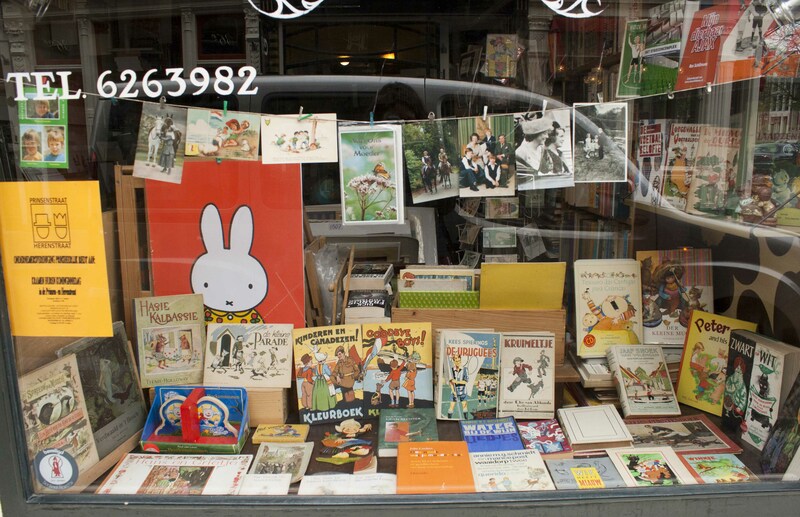 Marieke’s shop is very nice indeed and specialized in children books. 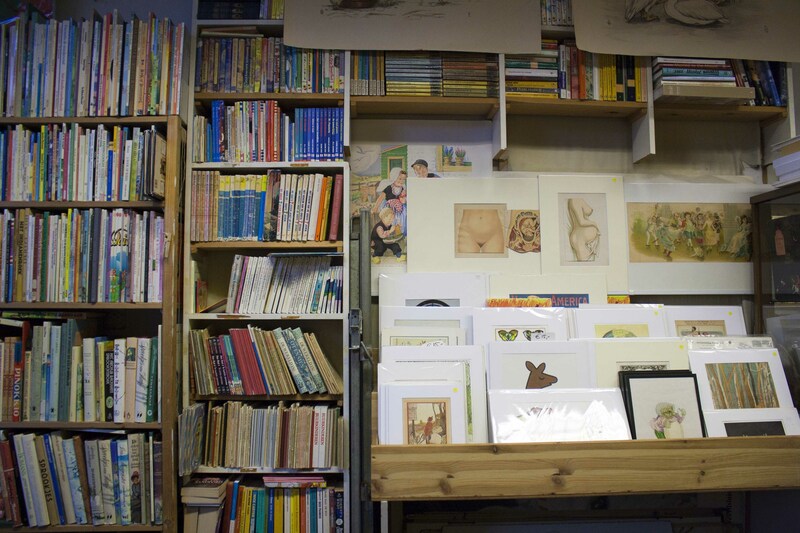 You missed the little bookshops in the Rosmarijnsteeg? Aaa… there is so much to see (and buy!) for the real booklover in Amsterdam. Maybe you like my (first) Guest Editorial for the Private Library (http://privatelibrary.typepad.com/the_private_library/2011/01/guest-editorial-a-private-library-in-the-netherlands.html). Thanks a lot for the link and comment. I love the article you wrote. I certainly did love all the bookshops I discovered in Amsterdam and have never been anywhere with quite the same bookish atmosphere! I also like the look of you blog but unfortunately can’t understand the Dutch – I feel as though I must be missing out on something, but I must be content with just looking at the lovely pictures! It was good to see that you enjoyed you recent trip to the Netherlands! Plese visit! I went there 2 years ago (couldn’t this year) and it was amazing. This shop looks really good too. I really need to visit Amsterdam properly sometime. There are so many bookshops I want to see and I keep telling myself that it gives me an excuse to go back! I really like Amsterdam anyway, so it’s definitely not a chore and I’m sure there’s a lot more for me to see as well!